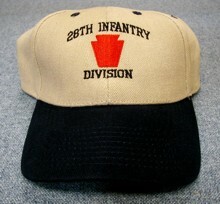 Golf Hat, cloth back, embroidered Red Keystone with black "28th Infantry Division". Braided cord. Adjustable to fit all. 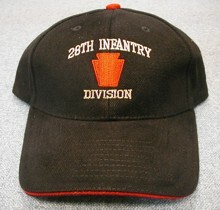 Golf Hat, mesh back, embroidered Red Keystone with black "28th Infantry Division". Braided cord. Adjustable to fit all. 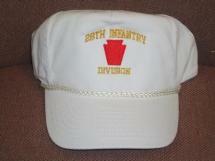 Golf Hat, cloth back, embroidered Red Keystone with gold "28th Infantry Division". Braided cord. Adjustable to fit all. 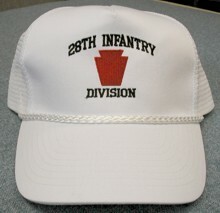 Golf Hat, mesh back, embroidered Red Keystone with gold "28th Infantry Division". Braided cord. Adjustable to fit all. Baseball cap, black w/red outlined pre-formed, sandwich bill, vented eyelets, embroidered in gold "28th Infantry Division" w/red keystone, Adjustable to fit all. Knit pullover with embroidered Red Keystone and gold "28th Infantry Division" lettering. 100% turbo acrylic. Hand washable, air dry. No cuff knit pullover. 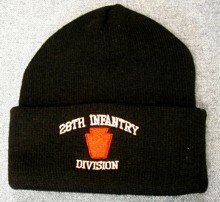 Black pullover is embroidered with Red Keystone and gold "28th Infantry Division" lettering. 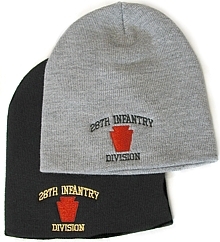 Gray pullover is embroidered with Red Keystone and black "28th Infantry Division" lettering. 100% turbo acrylic. Hand washable, air dry. Base ball cap, vented eyelets khaki with dark blue bill. 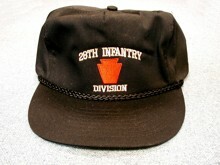 Embroidered in black the words "28th Infantry Division" w/red keystone. Adjustable to fit all. 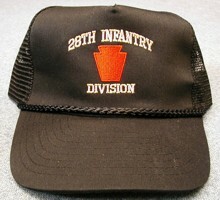 Charcoal black bucket (floppy) hat embroidered in gold words "28th Infantry Division" and Red Keystone. 100% Cotton. 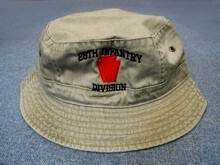 Khaki bucket (floppy) hat embroidered in black words "28th Infantry Division" and Red Keystone. 100% Cotton. 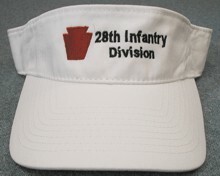 Visor, white with embroidered black words "28th Infantry Division" and Red Keystone. 100% cotton, fabric strap with velcro closure. Adjustable to fit all. 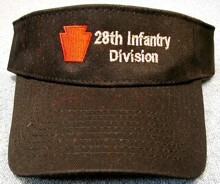 Visor, black with embroidered gold words "28th Infantry Division" and Red Keystone. 100% cotton, fabric strap with velcro closure. Adjustable to fit all. 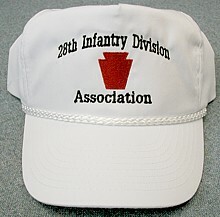 Association Golf Hat, solid cloth back, braided cord, embroidered black words "28th Infantry Division Association". Adjustable to fit all. Black military beret with flash. 100% wool. Dry clean only. All sizes available. Base ball cap, vented eyelets, navy cap with red bill and white emroidered stars. 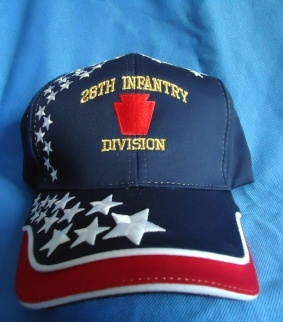 Embroidered in gold the words "28th Infantry Division" w/red keystone. Adjustable to fit all. Base ball cap, vented eyelets, black cap with black and /red outlined pre-formed, sandwich bill. 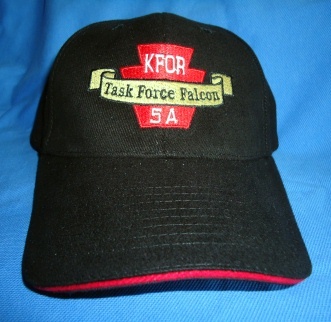 Embroidered with Task Force Falcon logo. Adjustable to fit all. 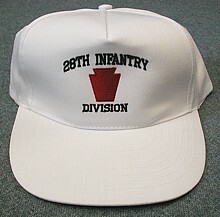 Association Golf Hat, solid cloth back, braided cord, embroidered gold words "28th Infantry Division". Adjustable to fit all.